Gnocchi are Italian dumplings that are made with potatoes and flour then boiled just until they're fluffy little pillows of goodness. 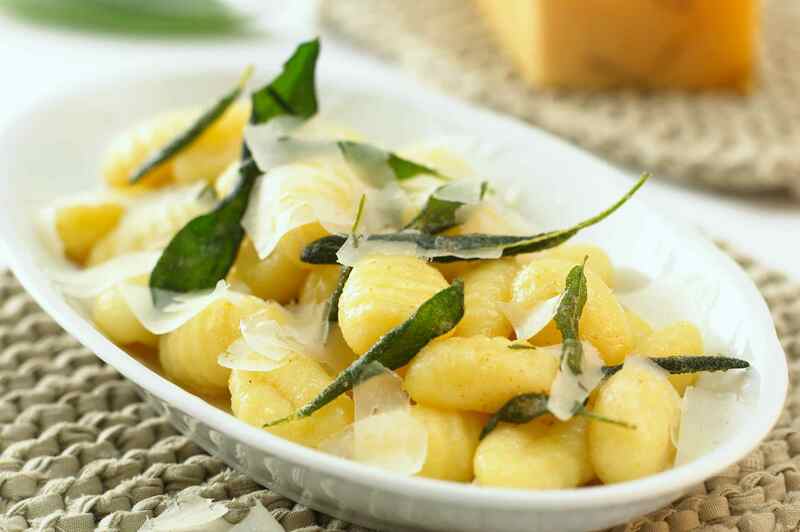 A simple sauce of butter, fresh sage leaves, and Parmesan is a classic accompaniment to gnocchi, and it's easy to make. You could use store-bought gnocchi or make your own from scratch. If you use store-bought, frozen is often better than the packaged kind, which can be a bit dense. And you can sometimes find fresh gnocchi at an Italian deli, if you happen to have one nearby. Sage and potatoes are a natural pairing, perhaps because they are both harvested around the time the weather starts to cool down in September or so, which makes great quantities of each available at roughly the same time. At some point in the distant past, peasants who had plenty of potatoes and sage on hand after the harvest naturally started combining the two, and, thus, today we have what has become an Italian classic: gnocchi alla salvia ("gnocchi with sage"). To make this dish, you're going to briefly fry some fresh sage leaves in olive oil, then remove the leaves to drain on paper towels. Add about half a stick of butter to the sage-infused oil and swirl it around until it melts. Season to taste with salt and pepper. Meanwhile, boil the gnocchi until they float (about 2–3 minutes), then remove them from the pot with a slotted spoon to drain, and transfer to a bowl. Toss with the instant sage-butter sauce you just made, adjust seasoning as necessary, transfer to serving plates, then top with the drained, fried sage leaves and thinly shaved Parmesan. Delizioso! Carrots are a highly recommended addition to tomato pasta sauce for their sweetness, fresh flavor, and bright aroma. Since it's a pureed sauce, you won't see the carrot, but it'll bring a dimension to your pasta sauce that you'll definitely notice. Because you don't want to overpower the gnocchi, a lighter flavor like this is just right. The recipe for this tomato sauce calls for both carrots and tomatoes. You'll sauté the carrots and onions in extra-virgin olive oil, then add two 28-ounce cans of crushed tomatoes, plus some chopped garlic, salt, and a bit of sugar. Simmer for about half an hour, then puree in a blender or food processor until smooth. Taste. Toss with the cooked gnocchi and garnish with fresh basil. Traditionally, pesto sauce meant a sauce made with basil, olive oil, pine nuts, Parmesan, and garlic. But these days you can use any leafy green (spinach, parsley, mint, whatever), as well as any sort of nut, such as walnuts, pistachios, or almonds. And while hard cheeses are best for making pesto, you can experiment with goat's milk cheeses, sheep's milk cheeses. and others. Making pesto sauce is mainly a matter of pureeing the greens, garlic, and nuts, and then stirring in the oil and cheese. Heat it up, adjust consistency and seasoning, and then toss the cooked gnocchi in the pesto and serve. If you're going to use alternative ingredients, use roughly the same proportions you would in a classic basil pesto sauce recipe. Here's another seasonal pairing. So many mushrooms appear in autumn—the woodsy porcini, the chanterelles, and more—that it's natural to combine them with potatoes and sage. It's not difficult to make a really simple mushroom sauce, but one thing that's important is to sauté the mushrooms in butter for a long time until they give up all their liquid and turn meaty rather than spongy. Do use butter or olive oil because so many of the flavor compounds in mushrooms are fat soluble, which means you need to cook them in fat to bring those flavors out in the sauce. So while they're sautéing, you can make a basic velouté sauce by thickening chicken stock with a butter and flour roux; adding cream, some lemon juice, more butter; then finally combining the cooked mushrooms and simmering them for a bit. Toss in the cooked gnocchi, adjust seasoning, and serve. Cooking then combining the velouté sauce and the perfectly cooked mushrooms yields a fantastic mushroom cream sauce recipe. This sauce is so yummy. The zesty flavor of the gorgonzola (an Italian blue cheese like Roquefort, Stilton, or Maytag) really wakes up the mild flavor of the potatoes, and the creamy texture complements the fluffy, pillow-like gnocchi. It's wonderful. The splendid gorgonzola sauce recipe starts with reducing heavy cream and white wine in a pan. Heavy cream works best because: 1) it won't curdle when you heat it and 2) it tastes much richer and creamier. Be sure to use a good wine because you will be able to taste it. After the sauce reduces by about a third, add the gorgonzola (crumbly, aged gorgonzola is best); simmer until it melts; then season to taste with salt, pepper, and a dash of nutmeg. The previous sauces seem fit for fall. But lest you think gnocchi is just a fall food, let us dissuade you. Here's a gnocchi sauce you can make in the spring, using fresh seasonal asparagus and baby tomatoes—but you could also substitute broccoli or spinach or mushrooms or whatever you happen to have. You'll want to sauté the veggies in olive oil, but only lightly so that they're still crisp and brightly colored. Then you can stir in a bit of cream, or you could just add more olive oil or even some butter. Finally, toss in the cooked gnocchi, garnish with grated Parmesan, and serve. This one's not actually a sauce but another classic Italian gnocchi preparation that involves baking it in a casserole dish along with a basic tomato sauce and fresh mozzarella. You'd begin by cooking the gnocchi in the usual way, then draining and tossing it with the tomato sauce. Finally, transfer it to a buttered baking dish. Top it with chunks of fresh mozzarella, some grated Parmesan, and maybe a sprig of fresh basil. Then bake the whole thing until the cheese is melted and slightly bubbly. Heaven.